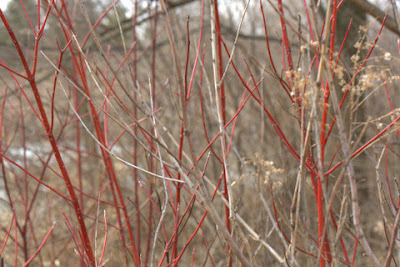 Cornus sericea or red osier dogwood has bright red twigs that really stand out in the winter. This shrub grows at the environmental education area at work. Silky dogwood, Cornus amomum can also have red twigs. Unlike flowering dogwood, these two native cornus species are shrubs rather than trees. The two can be distinguished in winter by taking a knife and cutting into the center of a young branch called the pith. Last night I thought I may have jumped the gun by calling this red osier dogwood. But thanks to my co-worker's trusty pocket knife, today we were able to peel back the bark and cut down into the pith. Sure enough, it was white in color, meaning that we did in fact have red osier dogwood! Silky dogwood has a tawny colored pith. Again, I am speculating this was planted, but look for red-osier dogwood in high quality wetlands in northern Ohio, especially north of I-71. Happy winter botanizing! Tomorrow's valentine: Swamp rose, Rosa palustris. Great Photos. The cardinal shots are great. I am formally from Illinois and that is the state bird. This is great and we have much more Silky Dogwood than Red Osier! But, it is amazing how bright red "red osier" can be! Knife and Hand lens are tools every naturealist should carry! A pretty plant, indeed. Wish we had some. Great shot...and a thoughtful one! A red osier basket would make a super Valentine's Day gift for your wife. I'm always fascinated with the brilliant color of this plant. Trey- Thank you. The cardinal is Ohio's state bird as well. Monarch- Red osier is certainly more rare in Ohio than silky. Red osier seems to be present only in high quality habitats, which are becoming fewer and fewer here in Ohio. 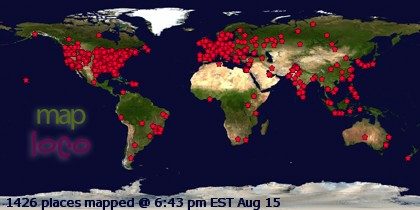 Thanks for adding me! This plant is great. I enjoy visiting other places, but I'd certainly miss the plants and animals that I have come to know here in Ohio if I moved to another part of the country. Marvin- Hmm..yes, this plant is a northern species. I'm not sure if this would survive as a cultivated plant where you live or not.. It is quite popular in the garden industry. JJ- That is an excellent idea!